This from Beatles walk tour guide Richard Porter in London: News learnt at the recent McCartney gig at the Royal Albert Hall from a VERY reliable source - Magical Mystery Tour is coming out on DVD in November - with Let It Be following in 2014 (or possibly 2015, according to another source). Also, a massive reunion of the extras in MMT (not just the three surviving coach passengers) is planned this month at West Malling Air field in Kent. The setup includes a Magical Mystery Tour coach (same model bus, painted a la the original), and the event is to be filmed by ITV for an October special about the film. 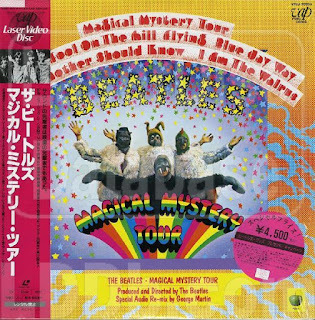 Of course, like the upcoming new edition "Yellow Submarine", we're hoping that Magical Mystery Tour will also be debuting on Blu-Ray for the collectors with high definition TV's. Last year, "Let It Be" director Michael Lindsay-Hogg, who was making the rounds to promote his autobiography "Luck and Circumstance," spoke about the film in an interview with radio station WNYC-FM. "We have been been working on it pretty much every year for the last couple of years. And the plan is, at the moment, to have it come out, I think, in 2013," Lindsay-Hogg said. So now it looks like 2014 or 2015. Even a Beatlemaniac like me couldn't see MMT as anything but an incoherent embarrassment, no matter how much it supposedly inspired Spielberg! Keir must not be enough of a "Beatlemaniac" I love it. It may have been incoherent as a story, BUT I see it as a collection of videos and footage of the guys having a good time. It's a sort of time capsule. Magical Mystery Tour 'an incoherent embarrassment'? - hardly. Worth the price of admission just for the "I Am The Walrus" sequence. Most of Magical Mystery Tour is great. I love it. I can't wait to see all of that speghetti in HD. I really love Magical Mystery Tour is a lysergic fun film, The clips of Your Mother Should Know, I'm The Walrus and Blue Jay Way are wonderful and fun, do not understand how a follower of The Beatles may not like it, could understand a casual fan who just likes the songs Yeah Yeah, but I do not expect from a true fan.